Language Systems South Bay students had quite the adventure last month while on a whale watching trip! 22 students plus PC Sylvia enjoyed an eventful day out on the water. The day started off quite foggy and we were concerned about visibility and whether we would be able to see anything. By the time we all arrived and boarded the boat, the fog had burned off and it was a beautiful sunny day! Our vessel was called “The Indian,” and Captain Mike and his crew greeted us with friendly smiles. Peggy, a volunteer from Naturalist of the Cabrillo Marine Aquarium/American Cetacean Society taught us many interesting things about the wildlife, coastline, and history during the trip. She was very informative and answered any questions we had. As soon as the boat left the harbor, we could see some sea lions that live very close to the harbor. Peggy also pointed out a bird called the cormorant. This bird is interesting because it dives deep into the water for its food and later rests on the rocks drying their feathers. Despite the sunny skies, the water was a bit rough. The ocean was rocking our boat more than we liked and before we could see any whales or dolphins, some students began to feel sea sick! One student even fainted! Captain Mike and his crew are very concerned about passenger safety and so they called on the Coast Guard to come and check on our student. While we waited for them to arrive, we could hear a helicopter circling above our boat. While we waited for them to arrive, we could hear a helicopter circling above our boat. The Coast Guard arrived quickly assessed our student for any injuries. They then decided to call in the Lifeguards to get our student off The Indian as soon as possible to take him to a nearby hospital to make sure he was totally fine. The Lifeguards got our student off our boat and onto their boat and took him to an ambulance waiting on shore. Once our student was safe with the Lifeguards, Captain Mike took us farther out to sea. We began seeing a pair of gray whales. The whales spend long periods of time underwater, but you can see where they will emerge by a looking for a spray of water. Gray whales migrate from Baja, Mexico to Alaska every year; they travel up to Alaska to eat as much as they can and breed. During their journey down south, female gray whales are likely carrying a baby gray whale that they will deliver in Baja. The migration takes place every year from January to April. We saw the pair of gray whales breach the water several times. 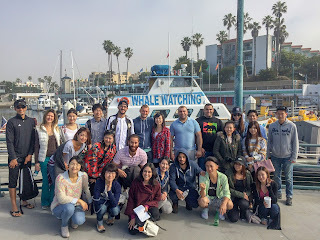 Some of our students were still a bit seasick, but nevertheless excited to see some whales! On our way back to the harbor, a pod of dolphins followed out boat back and “surfed” with us! What an exciting day! I hope our students will remember this adventure for a long time! !